Grosgrain: Pillow Factory Alphabet Down Filled Pillow GUEST GIVEAWAY!!!! CLOSED. Pillow Factory Alphabet Down Filled Pillow GUEST GIVEAWAY!!!! CLOSED. I love a good down pillow. But it's difficult to find quality down filled pillows for children. When I saw this one I loved it immediately! 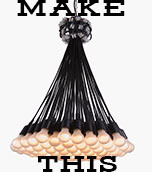 Handmade by the Pillow Factory, this pillow is truly a labor of LOVE. And the one to the left belongs to one lucky Grosgrain reader! It features a 95% duck / 5% down feather pillow form with a milky white linen cover with appliqued felt letters. The letters have been hand cut by the creative hand behind the Pillow Factory, Gioia. The front is batted with a 97% cotton batting and muslin backing to give the pillow some structure and "strength" while remaining soft. Envelope back closure that makes it easy to remove the case from the pillow form. 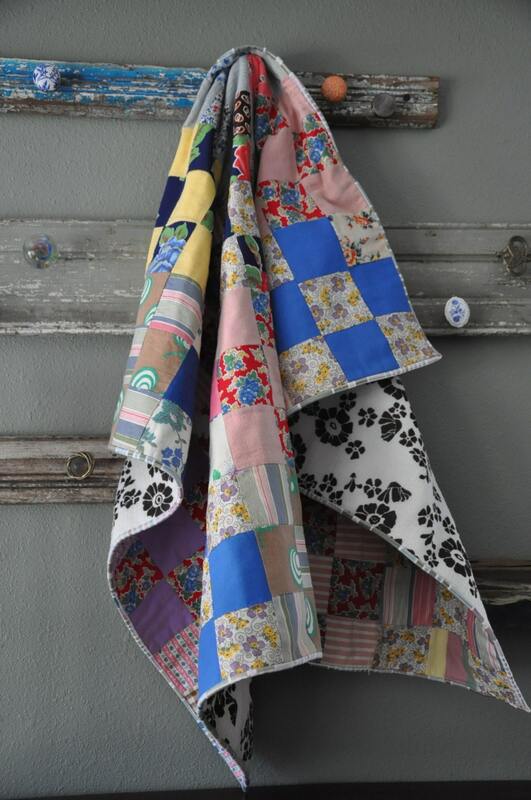 Gioia loves vintage fabric. At the Pillow Factory you'll find one.of.a.kind pillows that have been made entirely by her. Most of the fabrics used in the pillows have been selected at estate sales and are 100% pure-lovely vintage. 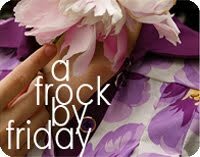 In choosing fabric she gravitates toward floral and geometric motifs, but really anything that catches her eye and that has bright colors. These precious "finds" regularly come to her in the form of fabric by the yard but also dish towels, table runners, pillow cases, sheets, garment remnants. All of them are machine washed before the creation process. Gioia is an Italian girl who moved to Southern California from a small town not far from Venice, Italy. She has lived here in the U.S for 3 years now, after marrying her husband, Patrick . She work part-time while finishing up a degree in Textile Restoration that she started in Florence. She started her little Etsy shop to make a couple extra bucks while doing what she absolutely loves the most: sewing and making functional stuff. Sewing is one of the best "tools" her mom has equipped her with and she will always be thankful for the gift she has given her. During her free time she loves to spend time with Patrick and friends. She also likes estate sales, rummage sales and thrift stores where she looks for fabric for her projects, fun clothes and stuff for the house. Until March 10th (in the us only) Gioia is offering free shipping on everything in her shop. International customers will get 10% off the item price. Please convo Gioia before purchase to take advantage of this offer. Include your item desired, name- so she can reserve it and list it with the correct price, and say that grosgrain sent you! those are lovely pillows! thank you for the giveaway! wow, I'd love to win!! I love her pillows! The alphabet one would be great for my grandkids, and down filled! What a great giveaway! I shared the giveaway on Facebook-I love this pillow!! What wonderful pillows! I am in love! Wow - her pillows are absolutely gorgeous - and that alphabet pillow - amazing! Thanks for the giveaway! OMG...that pillow would love fabulous on my new chocolate couch.. So adorable and colorful! Love her other pieced pillows, too. I ADORE this pillow!!! so super cute! i loooove that alphabet pillow! you always have the cutest things on here! just love it. I love that the "i" is lowercase on this pillow. This would be super cute in my daughter's room. That ABC pillow could not be more perfect for the couch in our ABC-themed playroom! Wow!!! I love this ABC pillow!! Wow these are really beautiful! I love the alphabet one... would be great for my son's room or actually I have an awesome ottoman that we use as a bench in our loft that it would look really great on. Love the pillow!! Hope I win! This would be so cute in my nephew's room! love it! I'm a little obsessed with pillows. I would LOVE to win! It's amazing! 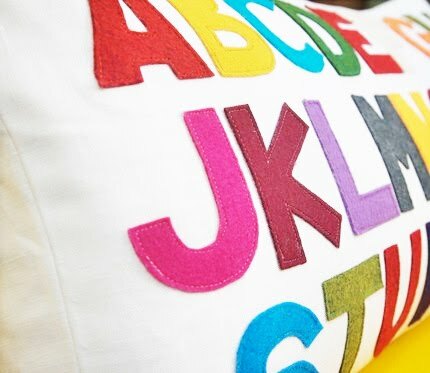 This pillow would look perfect in our alphabet play room for our kids. Adorable. Wow! Those are great! Thanks for the giveaway! Beautiful work! I'd love to win! How cute! Thanks for the giveaway! I'd love to get my hands on this for my baby girl's room! These are awesome pillows. We recently moved into a "cookie cutter" house. This baby - although beautiful - lacks personality. One of these pillows would add some very needed personality! What a really cute pillow!!! OMG. I am in love with this pillow and want many others she has made...Great giveaway! Wow. Unique and whimsical. Checked out her site and she's got some great pieces! it would be so nice if the pillow travelled to italy, near venice.....and land in the home she left three years ago! Link created! Roberta, the one who passed on the "tool"
So Cute! I love your blog it inspires me to be creative and gives me new ideas! super cute i love the shape and colors! I linked you and posted it on my Blog. Does this count as a comment too? Just in case- I LOOOOOOOVE the pillows. They are just gorgeous! So cute! I want to do my twins room in primary colors when they come and the teacher in me loves the ABC's! I'd love to win! LOVE THIS PILLOW! Wow! Thanks for sharing her with us! My daughter is learning her letters and would LOVE IT! I also linked to my facebook page!! That ABC pillow is so cute. My kids would love it. This would be perfect for my toddler who is learning her letters! How fun! What a fun pillow. Thanks for the chance to win one. What a great piece! I would LOVE to have this. That pillow is amazing - but my interest is more captured by the little quilt at the end. I love blankets! Fabulous pillows! I love beautiful functional art and what great examples of exactly that. I love this for my son's room! Omgosh, that Alphabet pillow is to die for! I'm in the process of creating a playroom and this would be the most PERFECT addition. I hope I win! I would love to win! This would be so cute for my nephew! I do love that pillow, good find. Great pillows - hop hope hope. I hope I hope - super great giveaway! i love her use of color! and i hope i'm the lucky winner! I adore those pillows! I've been trying to find some pillows for my bed set, because it's all mix matched and one of these would look SO cute on it! That pillow would go so wel in my house (where we have funky signs hanging everywhere).! Love this ABC pillow! My grandson's room would be the perfect home for it! This would be great in my daughter's nursery! Thanks for the opportunity. I would love to win this pillow. Perfect for my little girl in Kindergarten. Beautiful! And I love down. My DH works for a company that makes down pillows and comforters and I am so spoiled in the bedding department now! thats such a fun pillow! Thanks for introducing me to pillow factory! She is great! I love her "picket fence" pillows! What an awesome pillow! So colorful and cute! LOOOOOVE all of these pillows, but that ABC one is just awesome! Oh, I love it! So cool! What great pillows. I love linen with brights! Just posted to my facebook. Super cute pillows! I am dying over this pillow i'd love to win it! would love to have a chance to win! absolutely brilliant! i love the alphabet pillow. her work is full of life and originality! love it all. these pillows are absolutely amazing! my son is starting to get very interested in letters so the alphabet pillow would be perfect for us. Great giveaway, thanks for hosting, Kathleen! My daughters would love this! i cant help but begin to imagine how i will decorate my son's room around this pillow!! it is just too cute! Love the pillow! I wish I was as crafty as you are! Oh those are so cute!!! I'm crossing my fingers on this one, big time! Wow such great pillows! Thanks for entering me in your sweet giveaway! What a great teaching tool as well! My daughter would love that alphabet pillow!! love the second pillow. It would make a great mini body pillow. I love the font and the length of the pillow-it's a great one. Absolutely beautiful - I do a lot of work with felt so I can appreciate this! Plus it would go great in the new nursery! Awesome giveaway! What a gorgeous FUN pillow!!! Thanks for a great giveaway! I LOVE these pillows!! Would love to win! That pillow is the BOMB. Gimme gimme! 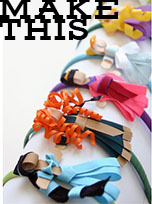 :) If I don't win, I might have to attempt to make something like that myself. Which could get ugly. So let's all hope I win, so the work and embarrassment can be spared. ooh my daughter would love this! This is super cute!! 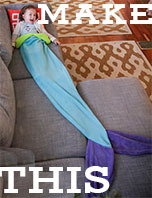 I have a little girl who would love it! Wonderful! I love how the alphabet one could be comfy and instructive! It would be great for my son! i love the pillow! the colors just "pop" against the white! L O V E the alphabet pillow!!!! i would love to win this pillow, is it weird I would put it on the master bed and not give it to my children? I love it. I am linking to this post tomorrow. Thanks for the giveaway, it's lovely. I would love this for my kids play room! What a great giveaway! I will be posting this on my blog! Perfect for my grandson.....Please enter me too! SUPER nice pillows! I love them all, but i know my 2 year old would loove the alphabet one. Love to win this wonderful pillow for my little daughter. All fingers crossed that I'll be the lucky one!!!! thank you for a chance at this lovely pillow, i would love to be the winner! This pillow would be perfect for my craft room!! Woot! I sure hope I'm that lucky reader! If I was to be such a lucky person to win this pillow, I will use it at my job. I work at Phoenix's Childrens Hospital in radiolgy. The children would love to see this beautiful pillow. I could use it to distract them by going through the alphabet while their procedure is being proformed. Plus, I could help promote this wonderful business. 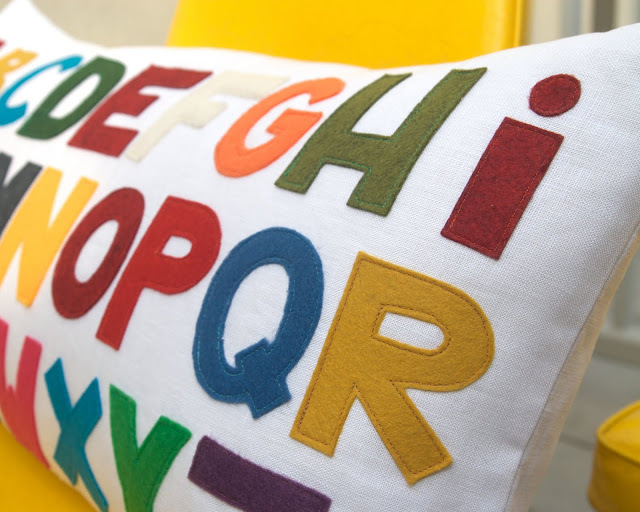 what a gorgeous alphabet pillow! hope i win! Those pillows are just beautiful. I am crazy about the alphabet pillow! amazing pillows! The alphabet one is so so cute! Those pillows are awesome! Any of them would look so pretty in my daughter's room. These are so fun! Wow! They look so soft and luxurious!! i love it! i want it! pick me! Hi! I made a link, hope you get it. I'm never too sure how these things work out. The pillow is great! I'm thinking it would look especially good in my daughters room to help her learn her ABC's. i love the pillow!! i'm going to be redoing my daughters room soon when we move and i think that pillow would be perfect!! the simplicity in these pillows is really wonderful. the colors are great... what a good style. sign me up. What a beautiful alphabet pillow, it would go perfectly with my daughter's room. so so so cute!that pillow would be perfect in our playroom! Adorable...perfect for some sweet slumbers! o.k. that is adorable! just what I need for my new nursery!! My two year old daughter would love the alphabet pillow! This pillow would be so cute in my daughters room! I just found your site by accident and I'm in love! :) Thanks for all the inspiration! That alphabet pillow is fantastic! I need to check out more of her pillows! that alphabet pillow is adorable! Love these pillows! Especially the alphabet one. Absolutely adorable! Would love to win! those are awesome!!!! I love it! Gorgeous! Would looks smashing in our playroom! What beautiful pillows! I am in awe. So adorable pillows.... would love them for my daughters' room! hi! love the pillows!!! i also posted about this on my blog. Such a cute pillow! Shared on Facebook! Such a cute pillow! I would love to win! Leaving a comment and linked it in my blog. Would LOVE to win this cute pillow. Thanks!!! I love all the scavenged fabrics and the recycled aspects. The pillows in her store are gorgeous and this one would be great in a child's room! Those are beautiful pillows-love the bright colors! These pillows are SOOO stinkin' cute~! This is really fun! It would look fab in my son's room ... Love it! This would be lovely for my children's room. Oh, pretty please. I would like to think I could make one myself - but in no way would it turn out as lovely as Gioia makes it. I'd so love to win one of those pillows. It would be nice not to have to make them on my own. So thanks a lot for the giveaway. i ABSOLUTELY LOVE LOVE LOVE THEM ALL but the alphabet pillow would be a HUGE hit in my home!!! Thanks for the chance!!!! oh..i love the pillows. and the alphabet one is divine. But all of her items are gorgeous.